The Planemeld was a massive Daedric invasion of Tamriel in the year 2E 582, during the Interregnum. 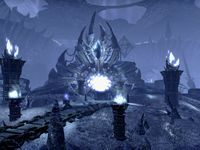 The Daedric Prince Molag Bal used his Dark Anchors, huge Daedric interplanar machines, in an attempt to drag Nirn out of Mundus and into his own realm of Coldharbour. The scale of the Planemeld is comparable to that of the Oblivion Crisis. It was ultimately prevented by the forces of Meridia and the Eight Divines. In the years immediately prior to the Soulburst, Emperor Leovic of the short-lived Reachmen dynasty known as the Longhouse Emperors legalized Daedra worship throughout the crumbling Empire of Cyrodiil. After hearing of this, Duke Varen Aquilarios of Chorrol summoned the military forces of the Colovian Highlands to depose Leovic, beginning a bloody rebellion that lasted from 2E 576 to 2E 577. Varen based his rebellion out of Bruma, where he coordinated his troops as they liberated Cyrodiil's other cities to further weaken Leovic's control. The rebellion claimed victory when Varen's forces stormed the Imperial City, and Varen personally dispatched Leovic at the foot of the Ruby Throne before proclaiming himself emperor. After Varen claimed the Ruby Throne, he wanted to legitimize his claim to the Ruby Throne and thus end the Interregnum, which could only be done by a Dragonborn, one with the blood and soul of the dragons. One of his Five Companions, the necromancer lord Mannimarco, convinced Varen he knew a ritual which would allow the emperor to become Dragonborn. To do this, however, they needed the fabled Amulet of Kings, which had passed into legend after the fall of the Empire. Thus, the Five Companions were formed in 2E 576: Varen Aquilarios himself, the sorcerer Mannimarco, the half-giant warrior Lyris Titanborn, the Redguard blademaster Sai Sahan and Elder Chancellor Abnur Tharn. They set out on a two-year quest to find the Amulet of Kings. The Five Companions were able to retrieve the Amulet of Kings and begin the ritual in the year 2E 578. The Five gathered at the Temple of the One in the Imperial City, and began to perform the ritual. At that moment, Mannimarco immobilized everyone present and revealed his true intentions: he was an agent of Molag Bal, and the ritual did not reignite the Dragonfires, but in fact did the exact opposite, weakening the ancient barriers between Nirn and Oblivion in an event known as the Soulburst. This event allowed Molag Bal to initiate the Planemeld. As the Soulburst occurred, aftershocks were swept across every corner of Nirn. Mages died or went mad, Red Mountain trembled in Morrowind, earthquakes shook Skyrim and heavy storms devastated the coastlines of Elsweyr and Valenwood. The constellation of the Serpent grew so large that it seemed to threaten every star sign at once. After the Soulburst, Varen mysteriously went missing. Lyris was captured by Mannimarco to be sacrificed, Abnur simply fled from the city altogether and Sai Sahan fled with the amulet, and hid it in the depths of Sancre Tor. Afterwards, the Tharn family, who were now the new rulers of Cyrodiil through the new Empress Regent Clivia Tharn, made a secret pact with Mannimarco who had agreed to strengthen the Imperial armies of Cyrodiil by resurrecting their soldiers. Abnur, Clivia's father, had grown a deep hatred for Mannimarco after the Soulburst, and he was soon captured, brought to the Castle of the Worm in Coldharbour and imprisoned there. In 2E 582, the Planemeld began. Transliminal portals called Dark Anchors were summoned throughout Tamriel, hooking into the ground and slowly ripping parts of Nirn away to float loosely in Oblivion. These portals were all metaphysically moored to a colossal construction in Coldharbour called the Great Shackle. The Planemeld was centered on the Endless Stair, a fortified impossibility constructed by the Mad Architect. Once an area was sundered from Tamriel, the pieces would reform as a pocket realm of Coldharbour before joining the Planar Vortex, an inter-planar realm where Tamriel and Coldharbour converged. Although fragile, the Vortex could only be accessed from within the Endless Stair. The biggest Dark Anchor opened above the skies of the Imperial City, intent on pulling the White-Gold Tower itself into Coldharbour. With Cyrodiil in ruins and the provinces divided by the Alliance War, few were left to oppose the invading Daedra. Meridia had her servant, Sees-All-Colors, assassinate the leader of the Fighters Guild in order to assume the role of guildmaster. Under Daedric command and funded by the wealth of Meridia's worshippers, the guild began refusing all other contracts and focused its efforts on destroying Dark Anchors and opposing Molag Bal's schemes. Meanwhile, the Five Companions were reformed by the arrival of the prophesied Soulless One, who freed the Companions from Bal's clutches and reclaimed the Amulet of Kings, defeating Mannimarco in the process. In a final attempt to speed along the process, Bal sent a Xivkyn called Molag Kena to pose as the seemingly-deceased Empress Regent Clivia Tharn and "retake" the White-Gold Tower. 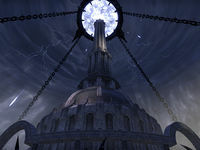 In truth, Kena sought an Elder Scroll within the Tower and planned to use its power to initiate the "Planemeld Obverse" and begin simultaneously pulling Coldharbour into Tamriel. However, a moth priestess called Terran Arminus had read the scroll before the Daedric occupation of the Imperial City, and had learned that she would need aid in order to save the scroll. This aid arrived in the form of a group of Undaunted, who helped Clivia's entourage ascend the shattered reality of the Tower's upper levels before being betrayed by the imposter. The Undaunted defeated Molag Kena atop the Tower before she could fully complete the ritual, and in the process destroyed the Anchor above the city. Coinciding with the events at White-Gold Tower, Bal's forces began to search the city for a relic called the Sublime Brazier. Housed in the hidden Dragonfire Cathedral in the Ayleid ruins beneath the city, this brazier was key to relighting the Dragonfires. If it was destroyed, Akatosh's Covenant would be broken and Mundus would be eternally vulnerable to Daedric invasion. This plot was uncovered by the Drake of Blades, a mysterious Dragonguard agent still operating within the city. With the help of the Soulless One and other allies, the Drake entered Dragonfire Cathedral and performed a ritual to become the brazier's immortal guardian. The Daedric siege of the cathedral was lifted in the process, and the leader of Bal's forces, Xivkyn General Malivus, was banished. The Drake would serve as guardian until the coming of the next Dragonborn (Tiber Septim circa 2E 854), effectively foiling Molag Bal's plot. As the Alliance War dragged on, Molag Bal's power over Tamriel continued to grow. Together with the Fighters Guild, the Mages Guild under Vanus Galerion finally arranged for a meeting of the three alliance leaders on the island of Stirk to discuss a potential counter-invasion of Coldharbour. Before an agreement could be reached, Molag Bal sent Daedra to the island to kill the alliance leaders. Although the attackers were repelled, the leaders quickly consented to a guild-led invasion, having seen Bal's influence firsthand. Although initially scattered across the realm, the invasion force quickly reassembled in the Hollow City, a sanctuary of Meridia within Coldharbour. After destroying the Great Shackle and breaking through the last line of Dremora defenses, the "Army of Meridia" was given access to the Endless Stair by the restored Foolkillers Clan. 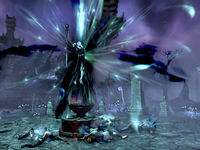 A small group entered the Planar Vortex with Meridia in order to use an artifact called the Light of Meridia while the Prince distracted Bal. This artifact destroyed the vortex entirely, resetting all progress Bal had made on the Planemeld. Thinking themselves victorious, the invasion force returned to Tamriel. However, Molag Bal had simply retired to his palace at Heart's Grief and planned to attempt a second Planemeld when he had recovered his strength. In order to stop this, the Five Companions journeyed to Heart's Grief and confronted Bal using the Amulet of Kings. Mantling the power of Akatosh, the Soulless One faced the Prince in single combat and banished him to the Void, freeing the souls he had captured and ensuring an end to the Planemeld. This page was last modified on 21 October 2018, at 08:11.